Rattray Marsh is an “environmental gem” located in a unique natural setting within the City of Mississauga . As the last remaining lakefront marsh between Toronto and Burlington , this environmentally sensitive wetland offers a different experience for nature lovers. Rattray Marsh is home to a variety of wildlife and plants and a definite must see for avid bird watchers, photographers and nature lovers. CVC, along with local residents and other interest groups have implemented numerous trail upgrades in order to preserve the area’s many sensitive features. Raised platforms allow for wider and higher pathways designed to keep visitors on the main trails and the natural areas undisturbed. The popular waterfront trail travels through the property but there is no cycling allowed in the conservation area. Secured by CVC in 1972, and officially opened in 1975, Rattray represents many things to its visitors. Some remember how it was saved from the developer who planned to fill it in and build homes, while others remember it as a living classroom where they came for guided tours to learn about nature. Plant life is abundant and beautiful at the marsh. Rattray is home to a large variety of wildflowers, which include Ontario ‘s large-flowered trillium, jack-in-the-pulpit and the red-berried nightshade. There is also numerous tree species including oak, birch, willow, hemlock, ash and maple. Although bird life at the marsh constantly changes throughout the seasons, bird watchers relish in sighting the ever-present wood warbler, eastern kingbirds, tree swallows, grey catbirds, and spotted sandpipers. Wading birds delight in the marsh and creek habitat of Rattray. 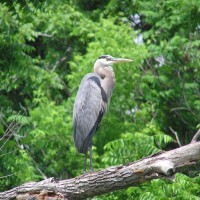 Look for black-crowned night herons, green-backed herons and great blue herons during your visit. Wildlife within the marsh includes rabbits, beaver, deer and occasionally foxes. Other creatures include the vocal spring peeper, American toad, turtles, snakes and more. CVC is lucky to have a great partner in protection with the Rattray Marsh Protection Association. This dedicated group of volunteers, help protect the Marsh resources through education and stewardship.